I’ve been considering writing this post for a while now. Since the moment I first played New Super Mario Bros. 2, in fact. But, obviously, I put it off, and it’s only due to Jacob’s brilliant piece on the game that I thought I’d revisit it, dust off my ranting cap, pull on my bitching pants*, and get down to hollering vaguely at the metaphorical children on my lawn. With a high profile release such as a Super Mario Bros. game, reviews are everywhere. That’s fine. And they vary pretty widely in opinion, which is fine too. What’s not fine, as far as I’m concerned, is the perpetually echoing criticism that it’s not different enough from New Super Mario Bros. That’s missing the point, and it’s missing it in several substantial ways. First of all, I will concede this: you have every right to be disinterested in New Super Mario Bros. 2. Of course you do. What baffles me, though, is that anybody would expect the game to be something other than what it is…and even to hold against the game the fact that it isn’t something different. The Super Mario Bros. series has splintered over the years into so many spinoffs and subseries that it’s literally quicker to list off the genres that Mario hasn’t made his own than to name all the ones he’s branched into. That’s where New Super Mario Bros. came in. It was a deliberate exercise in getting Mario back to his purest platforming roots. Gone were expansive 3D worlds and game-long gravity gimmicks. Mario’s primary weapon and mode of transportation were once again, at long last, one and the same: his feet. New Super Mario Bros. was a massive success, and it still sells well to this day, in spite of the fact that at least five hardware upgrades and countless releases stand between us and its release date. The reason for that is simple: it promised a return to basics, and consumers voted en masse with their pocketbooks to say, yes, that’s exactly the kind of promise we’ve been waiting to hear. That was in 2006. Six years ago. 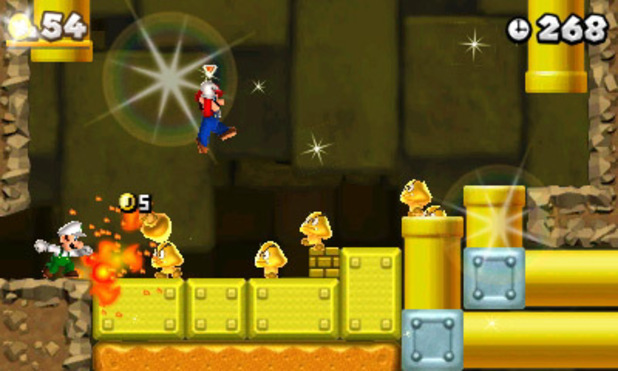 The fact that a sequel was released just last month doesn’t exactly scream “cash grab.” Enough time has passed since the original’s release that it’s fair to assume that fans might enjoy another set of worlds to hop, stomp and somersault through, so Nintendo released New Super Mario Bros. 2. And it’s been criticized almost universally for not being different enough from its predecessor. This is puzzling, as New Super Mario Bros. made its intentions clear. They were intentions that millions of gamers supported, and with pleasure. To criticize any game in the New Super Mario Bros. series for not being different enough is to miss the point; if you want something “different,” there are enough Mario games to suit your needs as it is. So many, in fact, that a return to basic platforming required a whole new subseries. That’s this. “Different” is explicitly against its reason for existence. I’m always surprised by the “not different enough” criticism of video games. Mega Man games faced that problem. Ditto Fallout and Fallout: New Vegas. But why? Is “not different enough” really a fair complaint? It’s one thing to say that you’d prefer not to play through another game so similar to the first, but that’s a matter of personal preference. To try to blame the game for that is a bit unfair, as that’s what the game has set out to do: further explore the world, characters, and game mechanics that it laid down in previous installments. If the series feels a need to evolve it certainly will — or will branch off into multiple paths of sequels — but should it be obligated to constantly do so? Video games seem to occupy this strange place in the culture that expects them to always be changing, always evolving, always hurtling toward the future at a pace we unfairly expect to exceed our own. This isn’t the case with films; we don’t expect the sequel to a gangster movie to be a musical about time-traveling leprechauns. Ditto music; when Neil Young releases several albums in a row of raw, rusty country-rock, we don’t complain that he didn’t do a disco album, followed by speed metal, followed by Gregorian chants. We know what Neil Young does well, and we like it when he does that. (In fact, the times he has deviated substantially from our expectations, he’s been critically raked over the coals for that transgression.) We don’t expect every song or album to sound exactly the same, but we do expect that it will fit into the scope of talent that suits him best. We want it to be Neil Young, and that’s a desire we can only have where there exists a set of expectations for something to be Neil Young. So why do we expect video games to always be offering substantially different experiences with each installment? Personally, I don’t want that. I’d rather know what I’m getting into ahead of time. I know I can rely on Mario to give me a fun adventure every time, and it’s that reliability that keeps him so dear to my heart. I don’t want him trying to surprise me every time, because then I can’t know what I’m getting into. Or, if he does feel the need to surprise me, I ask only that he make that clear from the start, by slapping a Sunshine or a Galaxy on the label to make me look twice, and consider this new game on its own merits and of its own potential, separate from whatever other expectations I may have. I don’t want the next Fallout game to be a real-time strategy. I don’t want Half-Life 3 to be an anime-influenced choose-your-own adventure. And I don’t want the sequel to a game I know to deviate so far from the original that it no longer fits into the world it created for itself. It’s sometimes nice to know where you stand. It’s sometimes nice to have expectations. And it’s sometimes nice to come home to old friends. That’s why they’re friends. We took the time to know them, we know what we can expect from them, and we’ve become comfortable around them. “Not different enough” isn’t a criticism. And especially in the case of New Super Mario Bros. 2, it’s practically a compliment. * That’s as in pants I wear while bitching, not pants that are so stylish that they could affectionately be described as “bitchin'”. Though my bitching pants are also pretty bitchin’. This echos my sentiments exactly. I think there is a tendency that we critics have to fight, which is projecting our expectations on a game, and then docking them when they fail to meet them. It’s something you see a lot on a few of the major gaming sites: criticizing a game for what it isn’t, rather than for what it is. This is an interesting argument to make in the context of this piece. I assume you’re speaking specifically of his 1980s work, which is more or less universally derided, but it really begs the question of whether it is proper to criticize something based on style over substance. One thing to remember is that Neil Young’s first period of major solo success is inherently tied to the era in which it happened: After The Gold Rush and Harvest were released in a time when the term ‘singer-songwriter’ was more or less a catch-all phrase referring to musicians who, at their core, shared a similar aesthetic of largely acoustic pop music, often with a pensive, reflective lyrical sensibility (James Taylor, Joni Mitchell, Carole King, Laura Nyro, Jackson Browne, etc). Granted, Neil Young had already shown a predilection for being more willfully raucous than this ‘aesthetic’ would represent (and I admit that my description doesn’t fully represent the ‘quirks’ that each of the aforementioned artists had), and even at his most straightforward, his lyrical sensibilities were generally more obtuse than, say, Carole King’s (or whatever lyricist she used at that time…I’d guess Toni Stern off the top of my head), but he had always had a flair for ‘folk’ trappings and accessible melodies, and like several of the previously mentioned musicians, he possessed a voice which was not conventionally ‘good’ but which fit the ‘yearning’ qualities of that material (and that era in popular music) quite well. Of course, as soon as he stepped away from that to any extent with Time Fades Away, the results were pretty immediate: his sales started slipping and the critical drubbings began (which, amongst other things, seems to have influenced Neil’s impressions of that album, which is a pity since I think it stands as one of his best albums)…and of course, when he made Comes A Time, which is in the mold most often recalled from those albums, he was rewarded with both critical regale and the best sales he’d seen since Harvest. The problem, though, is whether Comes A Time has a comparable level of quality beyond the stylistic parameters on the album. I would personally say that it doesn’t. In fact, outside of “Lotta Love” (which, although it wasn’t a disco song, was rendered in an arrangement which bears some similarities to disco by Nicollete Larson, and which became a hit for her) and the cover of “Four Strong Winds”, I can’t even tell you much off-hand about the album, and I know I’ve listened to it quite a few times. In short, it is a pleasing, but unmemorable, experience. Harvest, on the other hand, is a very uneven album (and much more diverse in its arrangements than most people ever mention), but I can hum, say, “Are You Ready For The Country” without being able to recall more than a fragment of Comes A Time’s “Look Out For My Love”. …But, he used the tried and true formula. That has to be acknowledged, right? Maybe. I agree that, sometimes, it is nice to ‘return to an old friend’, but the question is: should all of an artist’s works be highly reminiscent of that ‘friend’, even if that similarity is only ephemeral, or is it okay for them to be divergent, so long as they retain some internal quality that appealed to us in the ‘old friend’? After all, the original ‘old friend’ is still around for you to revisit anytime you’d like. I think the major issue with making this contrast in regard to video games, though, is because availability differs. If you decide you don’t like Neil Young’s latest album and that you’d rather hear Everybody Knows This Is Nowhere, all you have to do is go to your local record store/Amazon/eBay/etc. in order to purchase a copy, or pull it off of your shelf if you already have it. There haven’t been the constant format shifts in the music world that there have been in the video game world, so it is pretty easy to find a copy that will play on whatever you have that qualifies as a ‘stereo’. What about the original Super Mario Bros.? I assume it is still available through the Wii Store (or whatever it is called), but was it available for GameCube or Nintendo 64? In that case, I feel that it makes direct comparisons and contrasts more difficult.